One of the hardest things as a mother I have to do on a daily basis is to teach my children how to share. And when I say that it seems funny but the way I see it is; how am I supposed to teach them how to share when the entire world can’t seem to figure out how to share the one place we all call home? Whether you are a parent, a teacher or a caregiver, teaching children how to share is not always an easy task, especially for young children. Children younger than 7 are generally the hardest to teach because children are naturally born selfish, and sharing is an attribute that they must learn. Sharing is a fundamental part of life, for all age groups, including adults. When teaching children to share, you must understand their thought processes in order to help them understand the importance of it. It’s a classic tale, the story of Ebenezer Scrooge — the epitome of selfishness, the quintessential mean-spirited, miserly, narcissistic old man. Yet as Scrooge discovers the joy of good deeds, he blooms with the “helper’s high” – and his spirit is reborn. And a merrier man had never been seen, as the story goes. But, are human beings inherently generous or selfish? A new study finds that when people have to make the choice instantly, their first impulse is cooperation—which indicates that generosity is actually innate. Only when they have more time to consider their choice do they behave more selfishly. The researchers concluded that generosity is the intuitive human response because snap decisions are based on intuition. But given time, we can reason our way to a more selfish decision. Sharing is the joint use of a resource or space. In its narrow sense, it refers to joint or alternating use of an inherently finite good, such as a common pasture or a timeshared residence. It is also the process of dividing and distributing. Apart from obvious instances, which we can observe in human activity, we can also find many examples of this happening naturally in nature. When an organism takes in nutrition or oxygen for instance, its internal organs are designed to divide and distribute the energy taken in, to supply parts of its body that need it. Flowers divide and distribute their seeds. In a broader sense, it can also include the free granting of use rights to a good that is capable of being treated as a nonrival good, such as information. 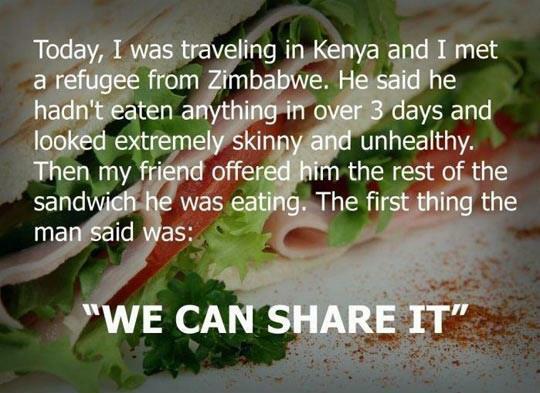 Still more loosely; “sharing” can actually mean giving something as an outright gift: for example, to “share” one’s food really means to give some of it as a gift. From the perspective of religion, to be good means to observe the rules and commandments dictated by God in the scriptures. Yet strictly observing these rules may imply deplorable things such as executing children who are disobedient (Deuteronomy 21:18-21) or that men shall rule over women (Genesis 3:16). Most societies – secular, and religious who prefer to abstain from following the strict rules of scripture – promote using the Golden Rule as the guide to ideal moral conduct. The Golden Rule means treating others as you would like to be treated yourself – or conversely, not treating others in ways you would not like to be treated. In other words, this is the idea of reciprocity. All life is engaged in a reciprocal dance. There is a constant exchange of gifts and resources. Nature is perhaps our best teacher about generosity, asking nothing in return but our good stewardship: to use the gifts of our intelligence, curiosity, creativity and compassion in replenishing ways that restore, sustain, and regenerate life. Generosity is the habit of giving without expecting anything in return. It can involve offering time, assets or talents to aid someone in need. Often equated with charity as a virtue, generosity is widely accepted in society as a desirable trait. Although the term generosity often goes hand-in-hand with charity, many people in the public’s eye want recognition for their good deeds. Donations are needed to support organizations and committees, however, generosity should not be limited to times of great need such as natural disasters and extreme situations. Thinking and caring about our interrelationship with others is one of the surest ways to change our old patterns of seeing today’s world as a place of conflict, tension, insensitivity, or one of boundless resources to exploit. Kind and clear-hearted caring can help us find our unique way of being of loving service. This may be one of the most important questions asked today, for it is based on a belief that all life on Earth has significance and purpose. As such, our relationship to other humans and this planet is better served through sharing and cooperating rather than competing, conquering, and over-achieving. We often have differing associations with the idea of sharing wealth, yet the word philanthropy derives from the Greek word philanthropos, which means “humanity, benevolence, or loving of humankind.” You’ll notice the definition is not “loving humankind…by contributing $1 million. Philanthropy is you and me doing what we can, with what we have, where we are. Philanthropy is taking action for the greater good. Philanthropy is each of us contributing our time, our talents, and our financial resources to make a difference. Chances are you have been practicing philanthropy most of your life. Generosity means literally noble-mindedness and is identical with the Greek virtue of great-soulness or magnanimity. In this sense, generosity is taken as a crowning virtue. It is the knowledge that our will is free and responsible for every action and the firm resolution to carry out what we judge to be best. Generosity is our refuge from self-centeredness. Unconditional giving may give us an oasis of peace of mind because we have reached out beyond our self to recognize and help others. As a result of our generosity we may also give others a physical or mental sanctuary of peace, comfort, safety, or healing. Generosity is freely sharing what you have with others. It is being willing to offer money, help or time when it is needed. To be generous means giving something that is valuable to you without expectation of reward or return. Many traditions measure generosity not by the size of the gift, but by what it cost the giver. Sometimes generosity requires pushing past a feeling of reluctance because we all instinctively want to keep good things for ourselves. Even so, we can structure our lives in ways that make generosity more spontaneous and fun. When we intentionally “live below our means” and avoid over commitment, we cultivate a sense of bounty or surplus that makes us want to share. When we give, we reap the pleasure of knowing we have made someone else’s life a little happier. One of the easiest ways to understand the necessity of generosity is to appreciate the gift of life. Your life is a perfect starting place. Consider that you are not a burden but rather a precious gift to Earth. In fact, it is impossible to appreciate your self as a gift without acknowledging that you are only one of many gifts of creation: air, water, soil, sunlight; people, animals, insects, vegetation; mountains, rivers, forests, deserts. If you value your life in a heartfelt way then you will find a way to generously value others. Helping others can not only make us feel good about ourselves; it can also increase our physical well-being. The mind and body aren’t separate. Anything we do to elevate our spirits will also have a beneficial effect on our health. A recent study by Cornell University found that volunteering increases a person’s energy, sense of mastery over life, and self-esteem. Other studies have demonstrated that such positive feelings can actually strengthen and enhance the immune system. Positive emotions increase the body’s number of T-cells, cells in the immune system that help the body resist disease and recover quickly from illness. Positive emotions also release endorphins into the bloodstream. Endorphins are the body’s natural tranquilizers and painkillers; they stimulate dilation of the blood vessels, which leads to a relaxed heart. It is meaningless to think of acting in accordance with the values of freedom, equality, honesty, and generosity as being selfless or selfish – only as constructive or destructive. In fact, by thinking of our actions as selfish or altruistic we are obstructing our possibilities. All of our values are shaped by our relationship we have with ourselves, other living beings, and the natural world. Generosity should not only be viewed as our behavior toward others, it is also our behavior toward ourselves. Generosity is not a measure of your worth, but a measure of your heart’s capacity and desire to give. By practicing generosity every day — to yourself, others, animals, nature — you are increasing the worth and beauty of life on Earth, and making it a peaceful sanctuary for all. This entry was posted in Uncategorized and tagged ancient egypt, children, consciousness, Ebenezer Scrooge, education, egypt, enlightenment, Generosity, god, Golden Rule, happiness, healing, health, human, humanity, islam, life, live, love, nature, Philanthropy, philosophy, Science, Scrooge, selfishness, Sharing is Caring, Ted Talks, Thought, wellness. Bookmark the permalink. Have a look at http://tinyurl.com/8xa22oe The Unexplainable Store. It may have precisely what you’re looking for.